UPDATE: the Datamined model looks nothing like the Animus above. It resembles a ball filled with something that looks like magma, but it has arms and legs like a golem (View in 3D is available). drop from Throne of Thunder. "Forged in the Throne of Thunder, these tiny creations are servants of the great Dark Animus." My question is... Will it be a mechanical pet? or a magical one? What I'd like to know is what kind of drop he is? Can I get him in LFR? This pet drops from Dark Animus is all difficulties, including the LFR. The drop chance seems to be between 3 % and 5 %. If dropped in the LFR, it will be treated as personal loot, meaning it will go straight to your inventory once the boss is killed. It is also considered extra loot, meaning that you can still get a piece of gear or a failbag and this pet at the same time. The pet is BoP, but can be traded with anyone if you learn it and then cage it. The caged version can also be put on AH, so expect to make some money off it if you do not want the pet for yourself. This pet looks truly amazing ingame. I'll be crossing my fingers every time i kill this boss. Goodluck to everyone else trying to get it! Got it in my bag next to the gold I got as loot. 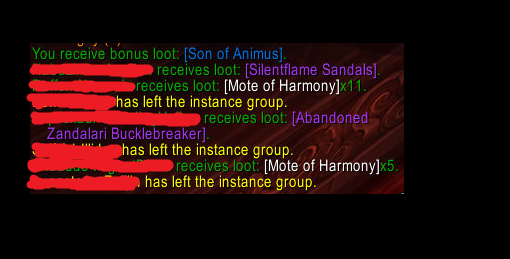 Not sure I am allowed to make a comment yet due to low "reputation", but this dropped for me in LFR (2013-04-06). Don't suppose anyone knows how to respond to a comment, or do I not have enough privilages to do that yet? I'm going to test to see how fascist this community is by posting this message. It dropped to me yesterday. I was in LFR and i got it straight to my bag. I caged it and put it in AH. It was sold for 31k! Hello, I was curious if these pets (Son of Animus, Living Sandling, and Ji-Kun Hatchling) would drop off of tokens that you use on their boss in LFR? Just sold mine on US-Trollbane for 29450g in less than 48 hours of posting. Is there anyone who got it from a token roll in LFR or normal? So not with the initial loot, but with the usage of a token? Wowhead is full of authority *!@#$s. I hope you all burn in hell, you pieces of @#$%. I got this pet today from Dark Animus in LFR, I also got a Secret of the Empire and a loot satchel. This pet is rare Quality and is worth around 10K on Sylvanas EU. Got him while in LFR tuesday night just before the lock-out, contemplating keeping him as he looked adorable, but finally decided to sell him as offers of 20k were too much to turn down. However, the next day running LFR on Wednesday i pulled Son of Animus again as my loot, meaning i got to keep the second one! What is the stuff about "players can win this item when selecting the following class specializations" all about? Can confirm (09/13/2013) that it can be won on a bonus roll. I'm sorry, I have to vent. Ever since I saw it, I've been wanting this pet more than any other. The Halls of Flesh Shaping wing of LFR has been open for six months. I have run it every week I could at least once, often multiple times (if I had bonus coins). My armory says that my main has killed Dark Animus 24 times. (My alts have a few more) I have used a bonus roll on each kill. I haven't kept perfect track, but that means I have rolled for loot on Dark Animus approximately 40 times and gotten nothing. In all that time, I've seen one person win the pet. I don't even want to do that math right now, 24 kills x 25 players (unknown number of bonus rolls) = 1 pet. Ever. Most of those bonus rolls were prior to 5.4 when pets weren't even dropping from bonus rolls, but no one knew that until the 5.4 PTR went up (or at least, I didn't). I've spent nearly every Rune of Fate I've ever had on this boss. My abysmal bad luck on obtaining this pet almost has me wanting to quit the game. I'm so angry about all those wasted bonus rolls, so angry about the amazingly low drop rate on all these LFR pets. Why? Why do these need to be so rare? It's ridiculous. Ran this on 10M Heroic earlier and got 2 of these drop from one defeat. So it is possible to get more than one per kill, at least on heroic, not sure about the other modes. This one is most likely the hardest (or at least one of the hardest) raid pets to farm. Been running ToT weekly on several characters (even managed to get the ji-kun mount) but not this pet. I'd say at least 50 attempts so far and nothing. Edit: 65 attempts until it dropped.